Covered call writing involves buying a stock and selling a call option. When a put is also purchased to avoid significant downside loss, it is referred to as a protective put and the strategy as a whole is referred to as a collar. When a put option is purchased on the same day that a stock is purchased, is it known as a married put. In essence, we are establishing a floor on losses (put strike) and a ceiling on gains (call strike). In its purest form, out-of-the-money calls (strike higher than current market value of underlying) and out-of-the-money puts (lower than current market value) are used. We must not lose sight of the fact that covered call writing (with or without puts) is an income-generating strategy. When we buy a protective put, we are purchasing insurance that will cost us money and reduce our overall returns. Before selecting the two strike prices, we must first determine what are goals are and only then can we make informed decisions regarding strike selection. For example, if our covered call writing goal without puts is 2% – 4% per month for initial returns, we may set a goal of 1% – 2% when factoring in the acquisition of puts. The left side of the screenshot shows the call option chain and the right side reflects the put strikes and premiums. Let’s first start by establishing a goal for initial 1-month returns for the collar. We’ll make it 2%. This means that when we add the credit from the call sale and deduct the debit from the put purchase, we end up with a return of 2% of the current market value of the ETF, which at the time was $18.84. This computes to a net credit of $0.38. Any combination of call credits and put debits that results in a credit of $0.38 or more will meet our goal of 2%. This also allows for additional share appreciation of $0.66 (from $18.84 to the $19.50 strike). Potential loss on the share side is $1.84 ($18.84 – $17.00). This allows for additional share appreciation of $0.16 (from $18.84 to the $19.00 strike). Potential share loss on the share side is $1.34 ($18.84 – $17.50). 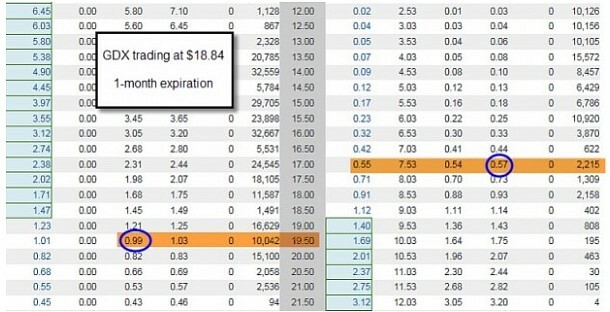 Note that if we used the combination of the $19.50 call strike ($0.99) and the $17.50 put strike ($0.73), the resulting net credit would be $0.26, falling short of our $0.38 or 2% goal. When integrating protective puts into the covered call writing strategy, strike selection of both calls and puts must be established based on the net credit generated from the sale of the call and purchase of the put. The process is always initiated by selecting an initial return goal and then viewing the options chains for the elite underlying performer. Our final decisions should be based on the amount of protection we want given the choices that meet our goal. As an example, choice # 2 above will give us more protection than choice # 1 but less opportunity for share appreciation as the more expensive put strike ($17.50) forces us to use a lower strike call ($19.00) in order to achieve a net credit greater than 2%. ***More information on the collar strategy on pages 233 – 236 of the Complete Encyclopedia-Classic version and pages 359 – 363 of the Complete Encyclopedia-Volume 2. The BCI team is proud to announce the launching a new educational program free to our members in the form of webinars, Q&A, interviews with experts and much more. Our initial 30 – 40-minute trial run will be held on July 28th at 9 PM ET in the form of a webinar with Q&A and additional comments. 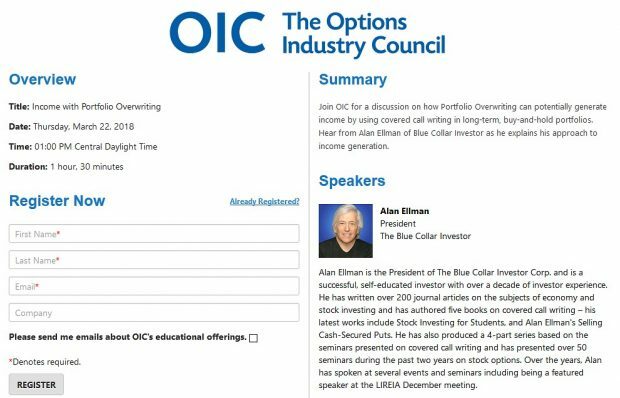 Alan will be hosting the webinar and Barry Bergman, the BCI Director of Research will be responding to your questions simultaneously. This event will be free to the first 50 premium members who sign up and will be recorded and available on the premium member site and free to all our premium members. We will be providing a series of these educational events to our premium members throughout the year. Our team is in the process of developing a landing and signup page for The Blue Hour and once ready we will open up registration. Ultimately, the development and format of The Blue Hour will be crafted based on your suggestions and feedback. Friday’s weak employment report cast doubt that the Federal Open Market Committee (FOMC) will be able to raise interest rates this summer. The charts are demonstrating signs of modestly bullish market movement. In the past six months the S&P 500 has been moved up 2.5% and the VIX has moved down by 25% to 13.47. The short-term trend is slightly bullish. Thanks for giving clarity about strike selections for this collar strategy. My question is how to manage the 2 strikes when stock price moves up let’s say by a lot? By the way I plan to see your seminar in North Carolina next week. Protective puts are much like other insurances in that they are there to protect against catastrophic scenarios but we hope the need to use them does not arise. If share price rises significantly, put value will decline due to the negative Delta and approach zero. If there is any time value left and we feel the need for the protective put no longer exits, we can sell the put and recoup some of the cost. Now we are left with a traditional covered call position. As the call moves deeper in-the-money as share price rises, we watch for the opportunity to use the mid-contract unwind exit strategy and execute a second income stream in the same month with the same cash. As always thanks for a great weekly blog attuned to interests of your readership. I realize you rarely, if ever, buy protective puts preferring instead to flex monthly strike prices. But some with lesser portfolio turnover doing over writing and/or with cost basis to protect find protection useful as you know. So let’s examine it in today’s context for dividend stock holders like me who use calls to enhance yield: it’s a skinny game with the low VIX! You have to write almost on top of traditional dividend payers like PG, MO, HRL, VZ, etc. for July to get more than 1% ROO. Then if you looked at the put you could buy to protect downside and still keep a 1% cash flow outside dividend you have to back off price making the collar proposition dubious at best. You have to be in real fear of a summer melt down, in my view, to do collars in this environment on the large caps. The flip side is who wants to buy protection when VIX is high and damage is done :)? If so inclined one would prefer to buy insurance when the sun is shining – like now! Alan, I appreciate your always prompt follow-up. I have read more frequent discussion of delta neutral strategies lately than I used to. Maybe you were ahead of the pack :)? I enjoy how you flex these blogs to meet the varied interests of your wide ranging subscriber base. I have recommended your books and this site to friends who are serious about managing their own money. I also enjoy reading your comments on this site. I have been following the over writing strategy on portfolios of blue chip dividend-grower stocks with good success. I look to sell them via ATM calls when they become over valued from a discounted cash flow model. I replace those stocks with new under valued ones and proceed to sell OTM calls for a 0.5% monthly return. If assigned and the stock is not over valued, I will sell puts to get back in, also for a 0.5% return. I am also willing to give up one month’s income to buy long dated 9 to 12 month SPY Puts at about 5% to 6% OTM for disaster insurance. The number is based upon beta weighing my portfolios. I will sometimes diagonalize the long puts with a sale of short dated ones, usually with a slightly less number of contracts (Ratio Diagonals) This gives me a more favorable T+0 curve if I wish to cash in the hedge for income on a market drop. I’ll reset the Puts if the market moves up by 3% to 4% or every 3 months. Thank you for your kind words. There is clearly a wealth of insight you can share with us as a skilled practitioner of this crazy options game. This week’s Weekly Stock Screen and Watch List has been uploaded to The Blue Collar Investor Premium Member site and is available for download in the “Reports” section. Look for the report dated 06/03/16. May i know if you could help me understand my options trades. 1. I did a covered call for HPE. What i have not understood was -161.60. It appears (this is not a BCI spreadsheet and entire column title cannot be read) that the -161.60 reflects a decrease in the value of the option contracts originally sold. For example, if 2 contracts were sold initially for $261.60 and today they are worth $100.00, the column in question would represent a price decline of $161.60. This is not necessarily a negative in that we expect option value to decline based on time value erosion (Theta). If Delta was a major factor (due to share price decline) we may need to execute one of our exit strategies. When I have open covered calls and then in your email upstate that stock goes off the recommended list what do you do with the position? Once our covered call positions are entered, they are managed as described in my books/DVDs NOT by a stock removal from our Premium Watch Lists. The best place to start is our 20%/10% guidelines for declining stocks. Dycom Industries boasted a stellar 3rd quarter earnings report on May 24th with a 44% “beat” on earnings and a revenue increase of 28.7%. As a result, analysts have raised estimates to earnings growth of 79.3% in 2016 and 18.6% in 2017. Our Premium Watch List shows DY in the telecom industry segment currently ranked “B”, a Scouter rating of “10”, a beta of 1.75, adequate open interest for near-the-money strikes and a projected next earnings report of 8/23/2016. The chart below shows an impressive recovery since the January/February selloff. Check to see if this security deserves a spot in your portfolio. With all this talk about rising interest rates i was wondering if you could comment on how it may effect our option premiums. Thanks for your help. There is an interest rate advantage to buying calls. The cash not spent on buying the stock can be used to generate interest. The greater the interest rate, the more valuable are the calls compared to buying the shares. There is an interest rate disadvantage to buying puts. Buying a put has an inherent interest rate cost-to-carry. Put value goes up if share value goes down. Instead of buying puts, investors can short stock. This puts cash into the brokerage account which can then earn interest. The higher the interest rate the more attractive is shorting compared to buying puts. That said, when interest rates change it is usually by only 25 basis points (1/4 of 1%) and this will impact our premiums minimally (see the chapter on Rho in my Greek E-Book) so I would concentrate more on changes in share price (Delta) and implied volatility (Vega) when evaluating changes in premium. Mueller-Glissman believes systematic call overwriting, in which an investor receives a premium for selling upside exposure on one of their holdings, is a better way to hedge equity risk than buying VIX futures or puts. Most of us on this site will agree that covered call writing can be crafted for most market environments whether we believe in near-term bullish or bearish changes. Something else I want to ask. Even though we may be able to avoid ER’s, then what about companies that can give ‘pre-announcements’. This could have happened in the contract, being the same one we may be selling CC’s in. Isn’t there anyway we can know if this were to happen? Really enjoy reading through your reports. I know of no way to predict when earnings pre-announcements will come out. They are usually made when companies hope to lesson the impact on share price when a negative report is expected to come out in the near future.